In the Fall is when the grapes get harvested and wine production kicks in. This is called crush, as in crushing the grapes, and there really is no better time to come to Napa or Sonoma than when the grapes are being harvested. The aroma of ripening fruit in the air mixes with the excitement of anyone who has a stake in wine, from the growers to the drinkers. If you have never been to Napa or Sonoma and can pick one time to visit then this is it! 1. When do they harvest grapes in Napa and Sonoma? Crush happens when the grapes are ready. Simple enough, right? Well, not quite because some years like 2015 grapes were ripe as early as July whereas other years they've held on until October. It's all a guess (darn you Mother Nature) but one thing is for sure - it is crowded in Napa Valley and Sonoma in Fall as visitors flock hoping to be there at the right time. 2. Where can I see Grapes being Crushed into Wine? 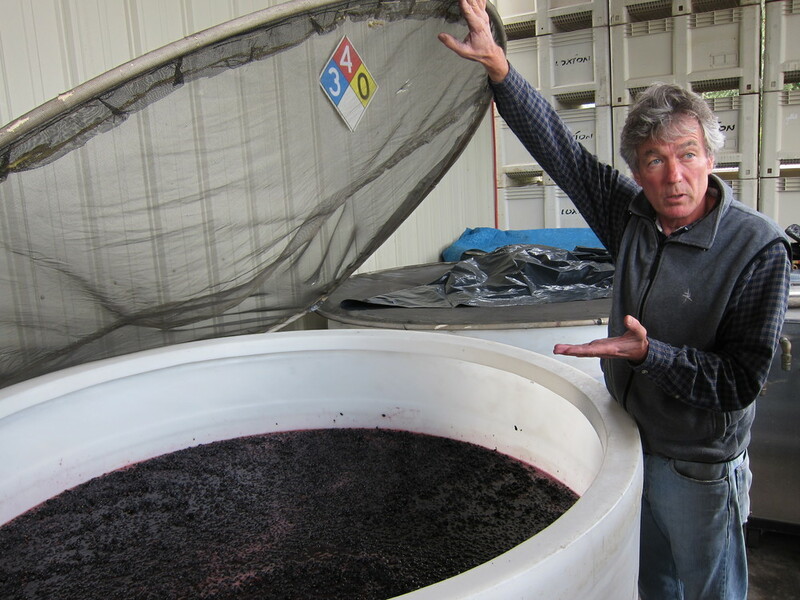 If you really want to see actual grape to wine production then book a tour. Good basic tours can be found at big wineries like Mondavi and Cakebread as well as smaller ones like Bell Winery who has an excellent "Grape to Glass" tour that's available two for one with the Priority Wine Pass (get it here). A walk through the vineyards, the smell of ripe grapes being crushed, it's intoxicating - and that's before you even have a sip! Frog's Leap: How fun to walk around the farm (an old frog farm!) while learning about wine, happily sipping along the way? Bell Winery: Small boutique with big wines, one of the best tours if you are as focused on tasting great wines as you are learning about them. Inglenook: Historic winery and huge production area. A lot to see and do here as well and the setting is so beautiful you may not want to leave. Mondavi: This place gets packed so do the tour instead of fighting for a space at the bar and see how wine is made. Good value tour, though tastings a bit skimpy at the end. Castello di Amorosa: The Napa castle couldn't get more crowded if they were giving the wine away so get far away from the crowds and do their tour that takes you deep into the castle. Tour is more focused on the castle than wine but still a fun time and you will still see production during crush. Cakebread: One of my favorite mini-tours, all tastings are done in small groups so no crush of people during harvest crush. 3. Where Can I Stomp Grapes in Napa like they Did in "I Love Lucy"? If you want to roll up your pants and stomp some grapes with your bare feet like Lucy did then head to Grgich Hills where $30 gets you some stomp time and a t-shirt where you can stomp your red stained feet on to take home. Here's all the info on Grape Stomping at Grgich Hills. No, you don't drink the stomped grapes and no, they don't make it into wine later. I mean, would you drink that wine? 4. OMG, it's so crowded! How can I get away from the crowds? Wineries during crush can get more crowded than Costco before a holiday. Think wall to wall people. Correction, wall to wall people who have been drinking wine all day! Not my style and probably not yours. So make it easy on yourself and make every stop a "reservations required" winery. These are often smaller wineries who have legal crowd limits so your experience during crush isn't much different than if were the dead of winter. You can also upgrade tastings at many of the larger wineries where you have a time and a spot just for you. 5. Where Should I Eat in Napa during Crush? You would think with the huge amount of restaurants in Napa that getting a reservation a few days before would be a no brainer but if smart people are already booking their spots right now. The most popular restaurants book up very fast during crush so if you have your heart set on going to Mustards Grill or Bouchon or any of the other well know restaurants don't delay. Bouchon has a great bar that is first come, first served. Come a bit early and grab a spot! Rutherford Grill's bar is my favorite spot and also open seating. You might need to hang around for a seat to open but these are prime spots and require no reservations. Bistro Jeanty has a communal table (open seating) that works just fine. In some ways it adds to the fun. The Bounty Hunter is ultra casual and has beer can chicken and BBQ and an extensive wine list. Located downtown. Zuzu's is hugely popular and doesn't take reservations so your chances are as good as the next guys to get a table. Don't forget Gott's, the gourmet burger place that's affordable and delicious. Looking for Napa on a Budget cheap eats? Here's my list. TIP: How Do I Get a Deal in Napa during Crush? Hate to sound like a broken record but get a Wine Pass, just $39.99 for my readers There's no posting on social media required like a phone app, no digging in your pockets trying to find a coupon that probably expired, you just flash the card or show it on your phone and you get two for one tastings. And if you want me to build you a custom agenda for a fantastic CRUSH experience I'll do so for no charge. I make sure that if you get the pass based on my recommendation that you get more than your money's worth. No unhappy readers, that's my motto, and so far of the thousands who have bought it the feedback is around 99% positive. Local Wally has never recommended something I don't love so trust me when I say this is the best way to stretch your wine tasting dollar!